We seem to have neglected the NCC so far in this occasional series, so maybe time to rectify that! Magherafelt was unusual in being a double junction. Mention the Northern Counties, and most people will think of the Belfast-Derry mainline and the branches and narrow gauge to the north east, but there was a also a less well known system of secondary routes to the south west, with Magherafelt as its nodal point. In NCC days, it was the location of a permanent way inspector whose remit covered the lines to Draperstown, Macfin, Cookstown and Cookstown Junction. The first section was a short branch from Drumsough Junction (after 1856, Cookstown Junction) to Randalstown, tacked onto the Belfast & Ballymena Railway (BBR) and opened on the same day (12th April, 1848), to provide a connection with the proposed Dublin, Belfast & Coleraine Junction Railway. When this failed to materialise, the BBR extended the line through Staffordstown and Magherafelt to Cookstown in 1856. The GNR also served that town from 1879. Magherafelt became a junction in 1880 with the opening of the Derry Central Railway north to Macfin, although most services ran through to and from Coleraine. The Draperstown Railway added an eight mile branch westward, with one intermediate station at Desertmartin in 1883. Neither of these concerns was financially successful, being absorbed into the Belfast & Northern Counties Railway (as it had then become), in 1901 and 1895 respectively. Obeying the “last in, first out” rule, the Draperstown branch lost its passenger services in 1930. The only passenger timetable I have seen for that line is 1903, showing three return services, which I assume was standard for most of the time. The branch was completely closed in July 1950, and the following month saw the withdrawal of all Cookstown Junction-Cookstown / Macfin passenger trains and the total closure of the Derry Central north of Kilrea. Five years later, the Cookstown-Magherafelt goods ceased, the Cookstown Junction-Kilrea goods lingering, partly to serve the Upperlands linen mills, until October 1959, the last service of any sort on the Derry Central and Cookstown routes. The Sunday arrangements were slightly odd: morning trains from Belfast and Cookstown combined at Magherafelt and ran through to Portrush, with a reverse of these manoeuvres in the evening; a morning Magherafelt-Cookstown and evening Cookstown-Magherafelt connecting service allowed day excursions from Belfast to Cookstown. There were pathways for “as required” excursions over the Derry Central, and you can always add livestock specials, overload goods and services for some of those holidays peculiar to the north of Ireland for additional variety. This was one line where the Second World War brought much more traffic: by June 1945, there were five daily Belfast-Cookstown services, and an equal number of Derry Central trains, although only the last up Derry Central ran through to Belfast and all others were connection to or from Magherafelt. There were also several local services between Magherafelt and Cookstown; and extra Saturday trains (including a through Derry-Macfin-Magherafelt service); and two Sunday Belfast-Coleraine workings with Cookstown connections. Most of the BNCR and later NCC locomotive classes could be used, except for the Moguls and Jeeps. 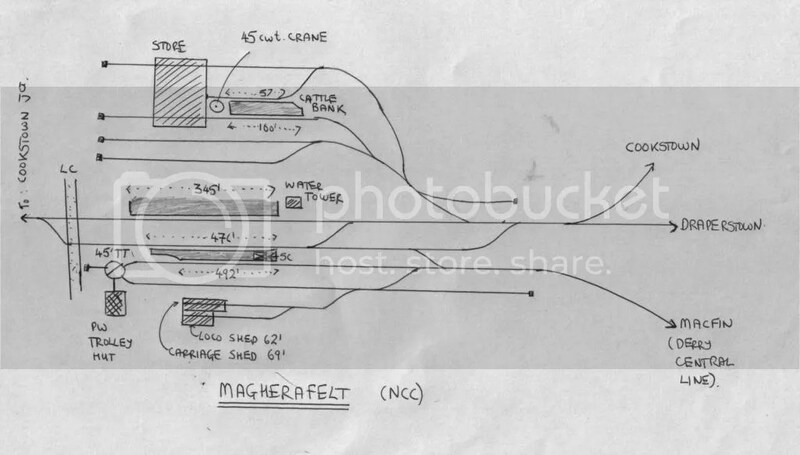 The layout at Magherafelt was quite complex: a signal diagram has not yet come to light, but, especially with the need for somersault brackets, full working signalling would provide quite a challenge. The Draperstown line seems to have been worked by train staff and ticket, with the staff unlocking the points at Desertmartin, which was not a block post. The other lines were operated by electric train tablets, the block sections running from Magherafelt to Castledawson and Moneymore on the mainline and Maghera on the Derry Central. Just to the west of Magherafelt, Cookstown Urban District Council had a quarry with siding connection released by the train tablet. A telephone circuit connected the quarry with Magherafelt signal cabin, and before blasting rock there, the foreman had to call the signal man who removed a tablet for the block section to Moneymore, under the “Release tablet for intermediate siding” rule and sent this with a railway employee to the quarry, where he remained until blasting was complete, and he could return to the station, report all clear and deliver up the tablet to clear the block section. The main two platforms had access to the Cookstown and Draperstown lines; one and the bay on the north side had access to the Derry Central. Dimensions are taken from the track plan in the IRRS archives and I did check the platform lengths: the figures quoted for the two sides of the island platform defy geometry, but are correct! Similarly, the carriage shed really was only 69’, barely long enough for two six-wheelers. The locomotive facilities were grouped off this section, and there is a photo of these in the Stephenson Locomotive Society Collection (Camwell 25553). The goods facilities on the southside were quite commodious for Irish standards, and include the unusual feature of a cattle bank with a siding on each side and a store with two roads through it. Both the original and my sketch have, I suspect, rather exaggerated the width of the warehouse. One, or at a pinch, two siding in the yard could be omitted and in view of the linear compression most modellers will need to apply, I suspect the crossover between the two main platforms could also be left out. There are a few photos in the Stations UK collection (RR7202, 6123) and the Real Photographs list (X5748, X218, but the modeller would need to do some more research on the main buildings. Always base your model stations on a real prototype, or you may end up with a real howler… like a level crossing in the middle of the passing loop! After Magherafelt, we move two stops up the line towards Belfast to Toome: the inclusion of “Bridge” in the name was a bit variable. By whatever title, the station opened in 1856, and lost its last service, the daily Cookstown-Kilrea goods in October 1959. It was located 36¼ miles from Belfast and 11¼ miles from Cookstown Junction. The notes above on timetables give a fair idea of the train service, although Toome usually had one extra goods train, a morning Antrim or Cookstown Junction-Castledawson working, which in the 1940s ran through to and from Magherafelt. Passing places with only one passenger platform were quite common in Ireland, but usually (and it seems the case at Toome), the crossings were of a goods and passenger or two goods trains. Up and down passenger trains could be handled simultaneously, but there were usually special rules for such occurrences, involving bringing both to a halt at the home signal and flagging one into the loop, or shunting one if both were scheduled to serve the station. In the 1930s, the electric tablet block sections were Cookstown Junction-Toome and Toome-Castledawson, the sidings at Randalstown and Staffordstown being released by the Cookstown Junction-Toome tablet. I don’t seem to have date for this track plan, so I am guessing that the NCC might have extended the loop in the Second World War and that the need to increase line capacity took priority over moving the road. Toome was the rail head for a military aerodrome during this period. The Northern Brick & Sand company had a 2’ line serving sand pits to the south of the NCC line, and Toome also handled a heavy sand traffic for wartime construction work. There were also extra troop trains: in October 1943 when many soldiers passed through Belfast, to relieve the GNR route, some troop trains to Armagh ran via the NCC Cookstown line. Another adaptation to such extra traffic was that Randalstown signal cabin, closed by the NCC as an economy, was reopened to divide the Cookstown Junction-Toome block section. Even the Draperstown branch was “called up” with a US army depot near Desertmartin and extra traffic to the terminus for mock battle exercises. The division of goods facilities, store on one side of the running line, loading bank and carriage dock on the other is unusual. If my reading of Stephen Johnson’s atlas is correct, the three siding serve Toome Quays. So, there may have been some wharves for interchange with water-borne traffic there: the Bann joins Lough Neagh just to the south. Loose shunting on these sidings was forbidden in the appendix to the working timetable. Rather confusingly, the plan is drawn with west to the right hand side! The bridge over the river (officially one of the various Carlisle Bridges in Ireland), was a lattice girder, with a central swivel span turning on a masonry pier. This opening span was locked by a Pinkerton’s Patent Point Box and needed the Toome-Castledawson tablet to release it. If you could track down some photographs, the river, bridge and wharf should provide the opportunity for some scenic modelling. I imagine that one of the sidings to the quay could be omitted without much loss of operational scope. No signal box diagram has come to light, but the track plan clearly showed independent traps for the pair of sidings and the one to the loading bank. There are two pictures in the Stations UK collection (RR6712, 1509). Johnson S (1997) Johnson’s Atlas & Gazetteer of the Railways of Ireland Leicester: Midland Publishing.